On the way to Waitomo we headed to another thermal area called Te Puia where we saw our first erupting geyser. It was spraying boiling water a few metres into the air. There were also loads of bubbling mud pools, this whole area feels very alive. Next we stopped at a kiwi bird house to see some kiwis. You rarely see them in the wild now so this was the best way. They look a bit like a chicken but with really long beaks. Waitomo is the area famous for all the underground glow worm caves. We decided the best way to explore these caves was in a rubber ring. 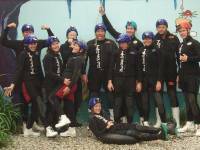 We were kitted out in full body wetsuits, helmets with torches and wellies and got fitted into our rubber rings. 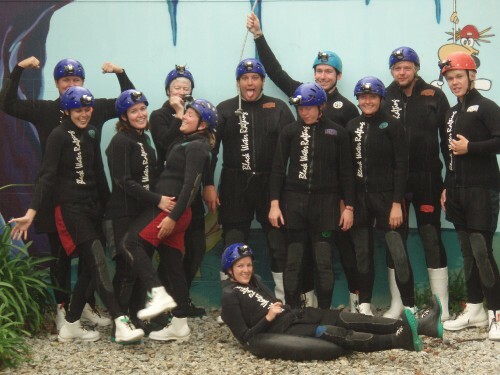 First thing we had to do was jump backwards into the river (with the rubber rings under our bums) It was freezing cold. Then once we'd acclimatised it was down into the caves. We squeezed our way through rocks and stallegtites, stumbled through uneven rivers, which occasionally housed deep holes and floated serenly along in the rings. Every now and again we'd all turn off our head torches and see clusters of glow worms lining the ceilings with an illuminous green light. The scariest point came when we had to leap backwards off a waterfall - pretty much in the dark! A couple of hours later we emerged into the bright sunlight in the waitomo forest. Back on the bus skydiving became the hot topic as the next stop Taupo, was the place to do it. Originally i decided to wait a few days, but with talk of the weather closing in I kinda had to make a split decision. I was last to put my name on the list, Gem also put her name down. It was now 4.00pm, they would pick us up at 5.00pm. We rushed back to get ready and get ourselves siked up. We waited for the bus.....and waited....and waited. Eventually we called the company. It had been called off due to too much wind but we were booked in for tomorrow morning at 8.00am, but ith the bad weather predicted we both thought our chance had passed.